$180.00 Drummer in full dress parade uniform, Life Guard Dragoon Regiment. Hand colored lithograph printed c. 1855, part of the series illustrating contemporary Russian military uniforms. Beautiful image in very fine to excellent condition. $245.00 Cavalry officer in winter uniform, Cuirassier Regiment of the Military Order of St. George from the 1854-1855 period. Large hand- colored lithograph of the Crimean War era in very fine condition. 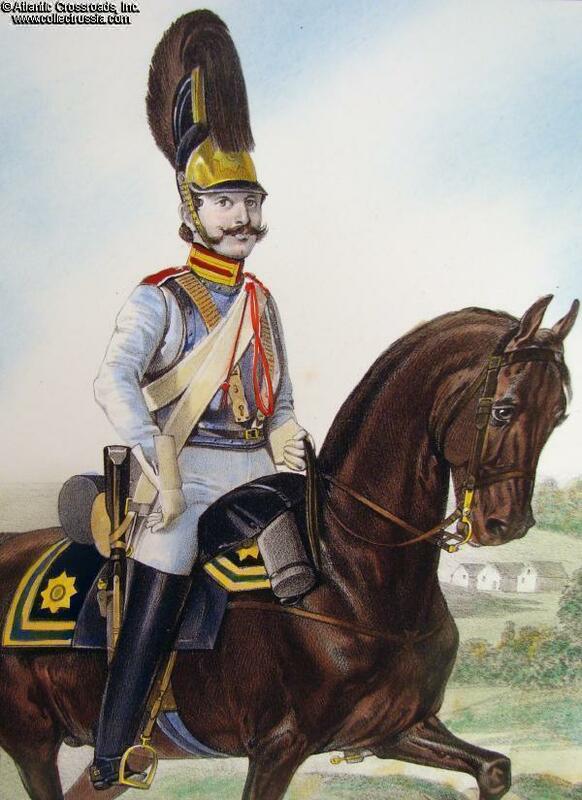 $130.00 Hand colored lithograph illustrating a Russian enlisted Trumpeter in full dress parade uniform	from Her Majesty's Life Guard Cuirassier Regiment from the 1838-1855 period. In very fine condition. $275.00 "The War between Russia and Turkey". While a primitive monoplane flies overhead, Russian infantry and Cossacks seem to destroy the Turkish army in this WW1 stone lithograph poster. This fantastic lubok from the first year of the Great War displays an almost icon-like lack of perspective. $245.00 1914 Illustration of Cossack Hero Kuzma Firsovich Kryuchkov,winning the first St George Cross awarded in World War I. A dramatic stone lithograph image printed in Grodno. $125.00 "The Feat of Cossack Kryuchkov", 1914. Handsome Lubok print shows the heroic act that won the first St. George Cross for the most famous Cossack of World War One. The smaller size of this lithograph makes it easy to both frame and display where space is limited. $240.00 Early WW1 Poster titled "Hero Soldier", summer 1914. Uncommon black-and-white lithograph depicts a heroic Russian hussar who at severe risk to his life rescued a wounded officer abandoned on the battlefield. The solider, Private David Vyzhimok, became one of the fist recipients of St. George Cross during the Great War. In excellent condition. $250.00 "A Dashing Skirmish of Our Cossacks with German Cavalry" . Heroic Cossacks dramatically battle Germans to the death in a colorful January 1915 print. $230.00 "War of Russia against the Germans. Heroic Feat of the Sotnik Botkin". Unwilling to surrender, a heroic Russian officer goes down fighting, killing every German he can! Lithographic print by the Krylov Trading House, Moscow. $150.00 "A Skirmish near Przemyśl", October 1914 lithograph. This poster depicts an initial stage of the second battle for the Austro-Hungarian fortress of Przemyśl which was to become the Eastern Front equivalent of Verdun. The artwork is clearly influenced by the Russian traditional "Lubok" style. Medium size poster in good condition. $180.00 "Russia's War against Germany and Austria". Early poster of fierce WW1 Russian cavalry charging panicked Germans who flee for their lives - all while a train explodes in the distance! A dramatic lithograph and war time poster. $120.00 "The Capture of Lwow by the Russian Troops", stone lithograph, August 1914. Uncommon early war poster in very good to excellent condition. $160.00 "The Destruction of the Austrian Army at Lwow", August 1914 lithograph by the Sytin Publishing House, Moscow. Very colorful and detailed artwork shows Russian cavalry charging into a retreating Austrian infantry column. Nicely make marked and dated. In very good to excellent condition. $250.00 "Defeat of the German Troops at Gumbinen", 1914 lithograph by Sytin workshop depicting Cossacks decimating a German cavalry unit. Very good to excellent condition with fresh colors; minor discoloration in the upper margin and couple of tiny tears on bottom edge. A very attractive artwork of cavalry vs. cavalry action is from the era when such engagements were becoming increasingly rare! $180.00 "The Battle near Gorodok". Heroic Cossacks chase Austro-Hungarians from the field in Galicia. A dramatic 1914 lithograph in excellent condition. An interesting detail: with some imagination, one can even see Austrian emperor Franz Joseph and Archduke Karl in the crowd of retreating enemy soldiers! $240.00 "General Battle with Austrians in Galicia. A Skirmish at Podgaitzev", 1914 lithograph. As the Austrian army flees, we see nice "Russian" details: a regimental flag, officers waving swords, plus a "hornist" blowing a properly drawn army bugle. $340.00 "An Innocent Victim at the Hands of 'Cultured' Butchers". A dead Red Cross nurse lies on the floor while a German corporal pauses for lunch and a beer; a famous "atrocity-image" from World War One. $175.00 "The Battle at Ivangorod". Lithographic poster depicting a surreal, dream-like battle scene in bright, almost 1960s colors, shows brave Russians defeating the Germans in hand to hand combat! In very good condition. $195.00 "German Atrocities", 1914. Filled will multiple horrors, a Russian "atrocity-image" chronicles Germans brutalizing and killing innocent civilians on the Eastern Front. In good overall condition. $295.00 "Great European War. An Episode of the Battle at Warsaw", circa October 1914. Siberian soldiers slay Germans cowering by an armored car; only airplanes appeared less frequently than these metal monsters in Russian wartime prints! An extremely unusual and dramatic lithograph in Lubok style. Very good condition. $220.00 "The Capture of a German Supply Train by Cossacks", 1914. Cowardly German infantrymen unsuccessfully try to surrender to the mounted Cossacks boldly plowing into their ranks and giving them no quarter! A medium size lithograph in good condition. $160.00 "Great European War. A Brave Attack of the Russian Bogatyrs (Mighty Warriors) at the German Front." Circa 1915 lithograph shows a full-fledged fantasy battle in the style of famous 19th Century war murals and paintings! $250.00 "Russo-Austrian War of 1914. The Battle Near Yaslo" ,September 1914. Picture of a Russian victory shows bewildered, cartoonish Austrians fleeing Cossack lances and Russian bayonets! A very early WW1 lithograph in remarkably good condition. $150.00 "Russia's War against Germany and Austria. On the Austrian Front", 1914. Austrian troops drown and face death and destruction from Russian artillery fire on the Bug River. Medium size lithograph in fair to good condition. $165.00 Portraits of His Majesty King of Montenegro Nikola I [Mirkov Petrović-Njego] and Crown Prince Danilo [Aleksandar Petrović-Njego]. A fine 1914 Father/Son pair of stone lithograph images. Printed in Moscow by the firm of Sytin. $975.00 "Chronicles of the War with Japan" , the Russo-Japanese War as reported by a Russian illustrated weekly magazine, an oversized bound volume containing every issue from 12 June through 27 November 1905 (the last issue being the final one of the series). Fascinating and quite unusual! $650.00 "Russian Miraculous Leader Suvorov", 2nd edition, 373 pages,compiled by A. Krasnitskiy with illustrations by N. Samokish, published by A. F. Devrien in Saint Petersburg, circa 1913. A novel-like biography of Aleksandr Suvorov (1729- 1800), the last "generalissimo" in the Russian Empire. Russian language.